Marchi Linconao has been jailed by Chile since 2013 but the evidence that was used to detain her using an anti-terror law remains suspect, with the main witness retracting her statement. 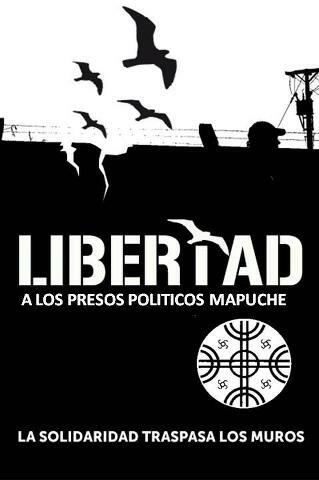 The four Mapuche prisoners have ended their hunger strike in Chile. Four indigenous Mapuche prisoners who went without food for 60 days in southern Chile’s Angol Prison called off their fast on Thursday after a Supreme Court decision overturned two of their sentences. The Chilean Supreme Court decided to annul part of the trial that in August convicted two Mapuche community members that have been on hunger strike for 60 days in Angol Prison. 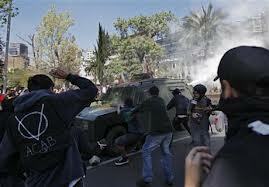 Militants attack police armoured vehicle in Santiago, Chile, during a protest in support of Mapuche land struggles and political prisoners on hunger strike, Oct 15, 2012. 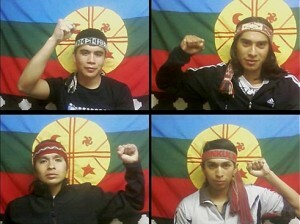 Four Mapuche youth on hunger strike. Amnesty International warns force feeding Mapuche political prisoners would be breach of human rights.